No more grumbling about ground elder! Yep, I get it. I have the same fight with it year in year out. Ground Elder… it sneaks in under the wall, entwines in the neighbour’s fence, strangles the baby onions and snickers at me when I try to get hold of it by the root. Introduced by the Roman’s (thanks, guys), by medieval times, monks would keep a patch growing nearby as a treatment for gout and arthritis. It’s other common name is Goutweed/wort and Culpeper, in the 1600s says ‘It should not be supposed that Goutwort has it’s name for nothing!’ This use, although most herbalist friends can quote it, seems to have largely died out. But it’s main function, when it introduced, was not as a medicine, but more as a potherb with benefits… In fact, it was so popular that it was grown as a food crop. 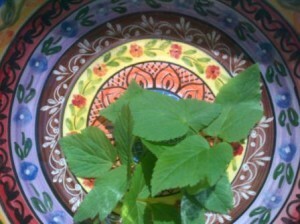 Ground Elder can be used as a spinach substitute, both fresh in salads and wilted in hot dishes. It should only be used before flowering – afterwards it becomes a strong laxative – you have been warned! You can delay flowering by nipping the flower buds early on. I have to say, I like it! Fresh in salad, added to curry instead of spinach… I’m thinking of trying it in risotto next, rather than Nettle leaf. I love the term ‘urban spinach’ as someone called it. So… my infestation has become a crop. And as weeds are defined as being plants you don’t want in your garden – it’s no longer a weed in my book. Another frustrating weeding session has been averted. Putting some fire in your belly!